In this case, it’s Channel A (left) that is b0rked. First port of call was to email Thomann UK to try and get hold of a schematic. Their piss-poor response was that one wasn’t available. No matter, we can freestyle it. Disconnect from the mains and remove the top panel. Remove the four screws underneath that attach the heat sink assembly to the chassis baseplate. This will make it easier to disconnect the push-on connectors from the spades on the PCB. Make a careful note of what colour wire goes to which connector on the PCB. If the connectors are stiff, pull back the insulating sleeve so you can get in with a small pair of connectors. Be careful you don’t rip the spades off the PCB. 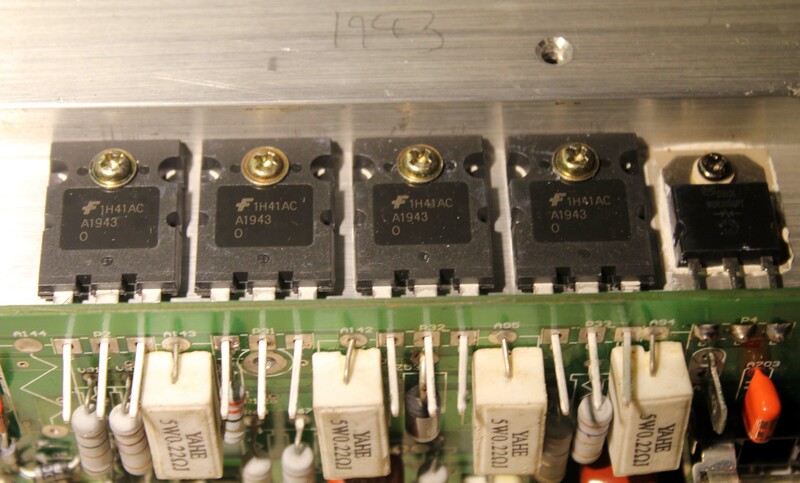 The output stage is made of a 4 2SA1943 PNP transistors hanging off the positive rail and 4 2SC5200 NPN transistors hanging off the negative rail. 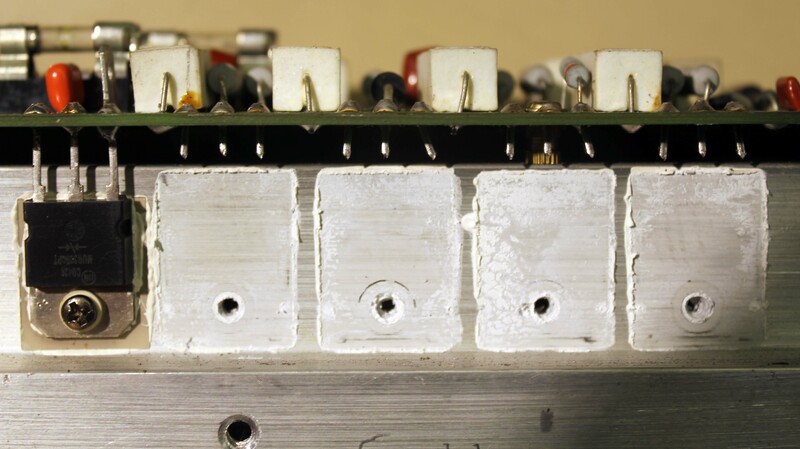 Laughing in the face of Design For Manufacturability, Thomann have designed the A and B amplifier assemblies to be weird mirror images of each other, rather than using the same assembly for both. This means on channel A (left) the NPN transistors are uppermost, whilst on channel B (right) the PNP transistors are uppermost. 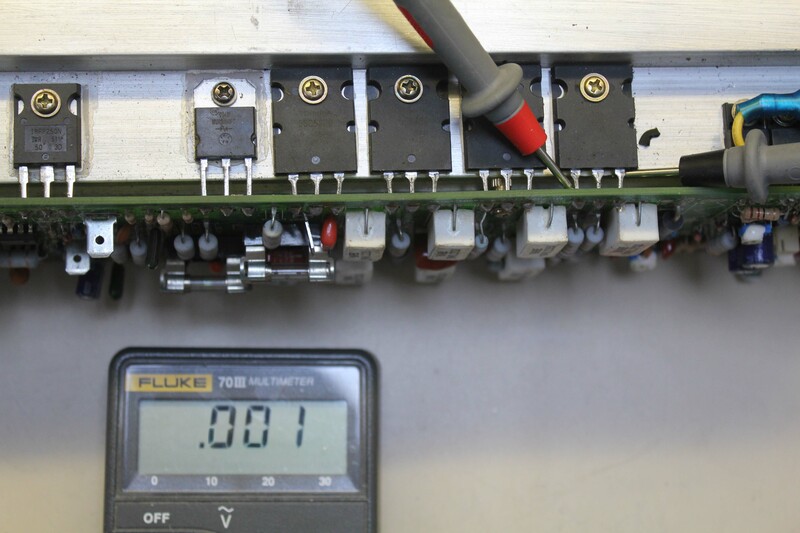 Use a DMM (digital multimeter) to do a diode test on the power transistors). This is complicated by the presence of low resistance paths on the PCB. Despite these, it should be bleeding oblivious which transistors have been fucked, as the diode test will show close to 0V in both directions. Having identified the dead devices, cut the legs near the body, leaving enough lead on the PCB side to grab with a pair of needle nose pliers. After making a note of which transistors go where, remove the screws and transistors. Don’t put the dead transistors in the bin. 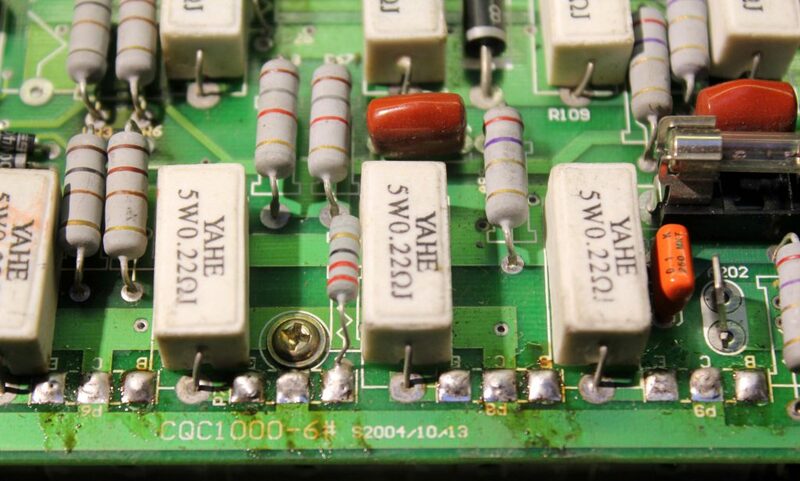 This is electrical waste – it needs to be proper WEEE disposal. Save up other WEEE waste and take it to your local tip. Clean off the heatsink compound with paper towels soaked in IPA. Carefully desolder the cut-off legs from the PCB using a high wattage soldering iron (at least 80W) and some thick desoldering wick. 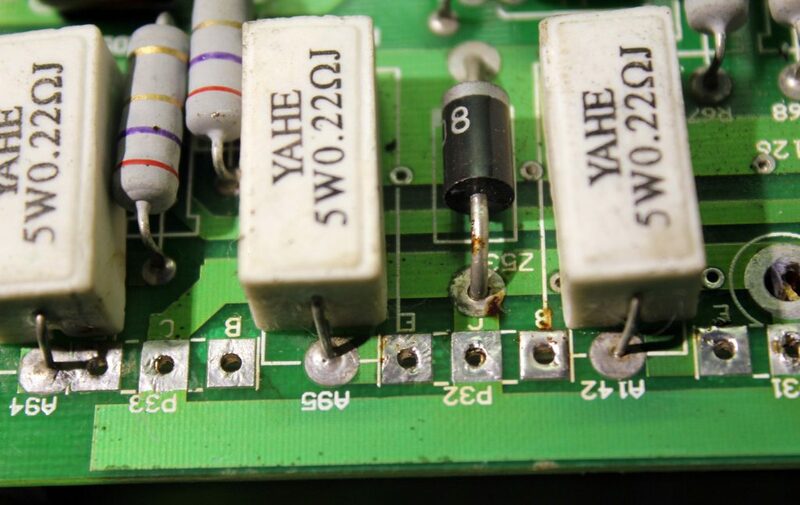 Use the wick to remove the solder so as to open up the mounting holes. You will get through a lot of wick. Clean off the flux with cotton buds and IPA. The transistor mounting holes should now be nice and clean. We now need some heatsink compound aka thermal paste. 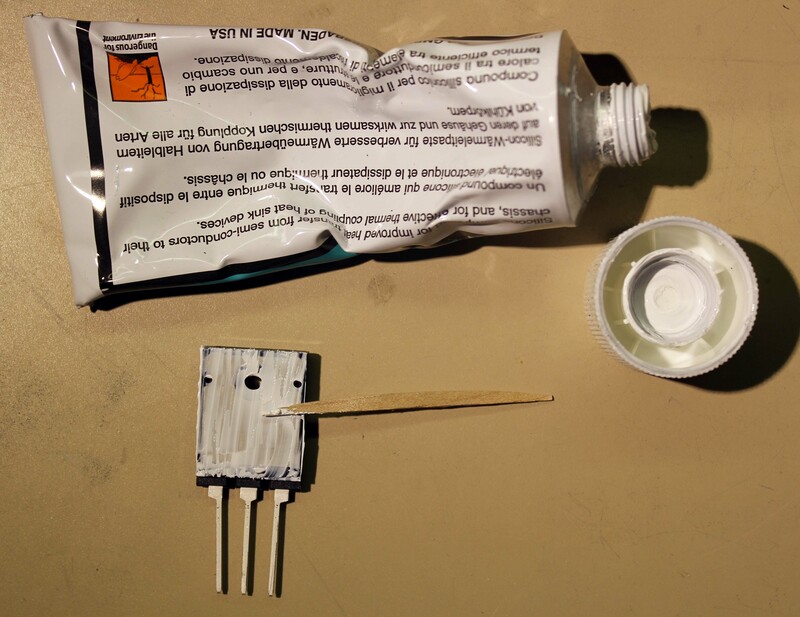 Apply a thin smear of the heatsink compound to the metal face of the transistor using a tooth pick, cocktail stick or similar. Carefully feed the transistors legs through the mounting holes. Screw the transistors to the heatsink now, before you solder them in. Solder the legs of the transistors to the PCB. Cut off the excess and clean with cotton buds and IPA. Repeat for the transistors along the other side of the PCB. Before you put everything back together, you should clean the fluff from the front panel air intake foam, and check the rear panel fans are OK. If a fan need replacing, they are 80 mm square, 20 mm deep, 24 V DC, for example this from Farnell. Cut the PCB connector from the old fan and solder it onto the leads of the new. Reconnect the wires and screw in the heatsink. Now for the moment of truth. 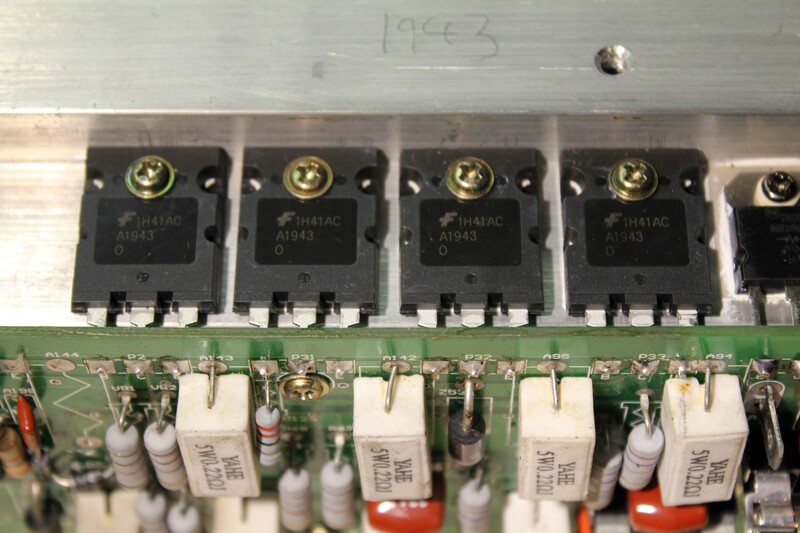 If you are feeling cautious, start off with lower value fuses (1 or 2A) before fitting the proper 16A fuses. 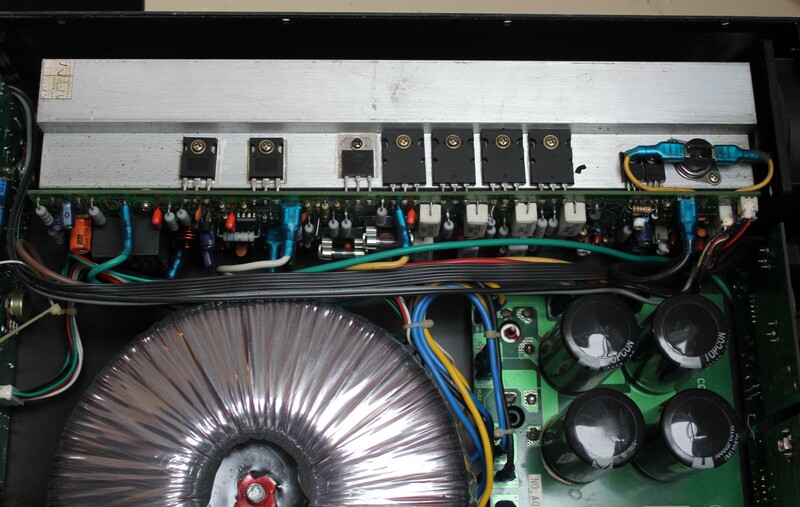 Be very careful if you power-up the amplifier when the top cover removed. 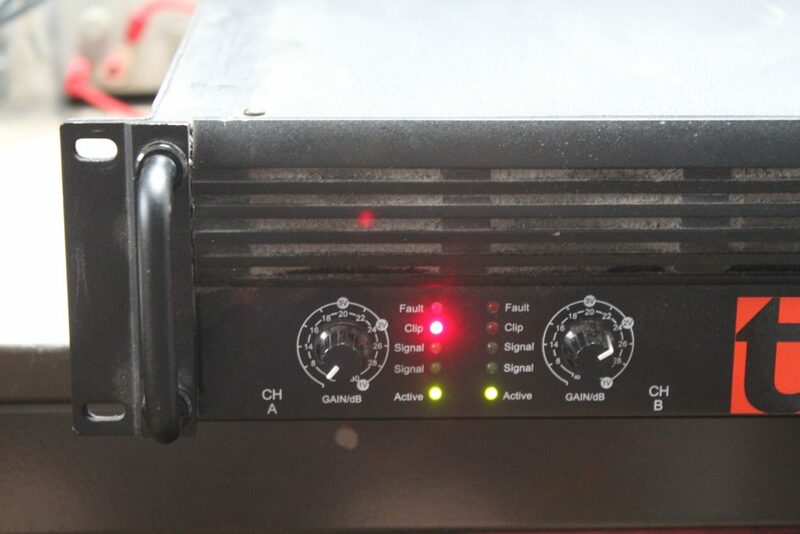 The rails are ±67.5V- the internal power supply is big enough to barbecue an ox, certainly enough to kill you. All being well, the fans should start, the protection relays should click and all should be well. 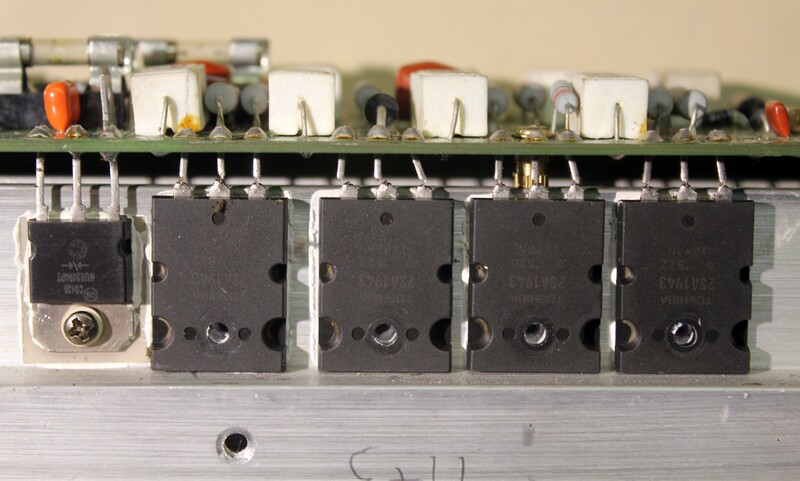 For bonus points, check the positive and negative rails on both sides of both fuses (should be around ±67.5V with no load) and remove the fuses to measure the quiescent current (Idq). I measured 19 mA on one amplifier and 25 mA on another. The positive and negative Idqs should be very close to each other in value. 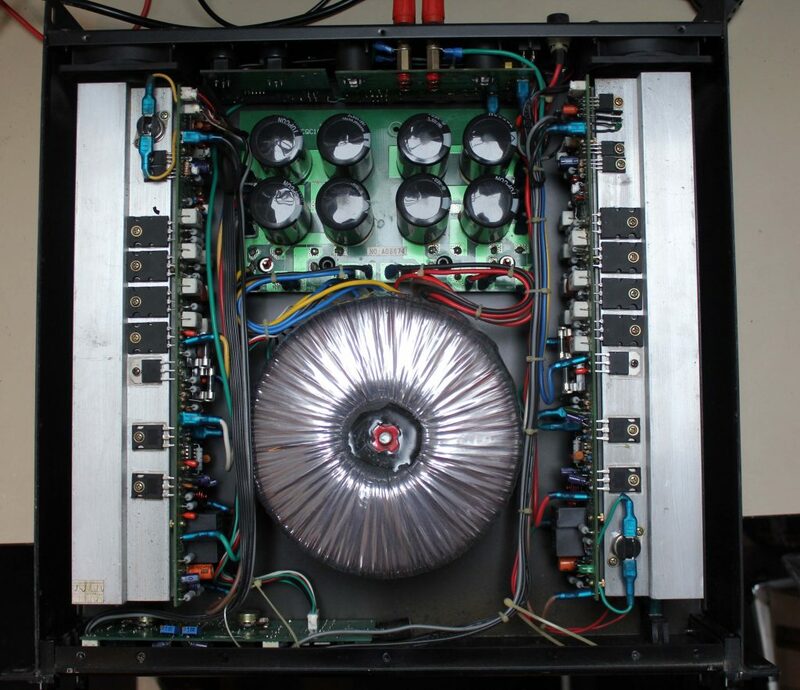 This entry was posted in Audio, DIY. Bookmark the permalink.